If you’re busy like me you often don’t have time to plan the week’s meals in advance. As a result, you may find yourself roaming the grocery store aisles looking for inspiration and trying to figure out what to make that’s healthy and fast. Well, the next time you come up short on meal ideas, give this recipe a try. 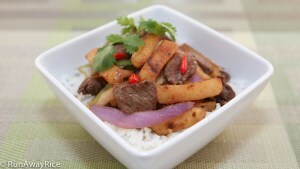 This Stir-Fried Beef and Potatoes dish is the perfect 30-minute meal. From start to finish you can whip up this tasty stir-fry in 30 minutes or less. My not-so-secret ingredient is frozen French fried potatoes. They are really convenient and cut the prep time in half. For even more time-savings, buy the beef already cut into thin strips. Add a salad or a simple soup and dinner is ready. Enjoy! Cut beef into bite-sized slices. In a medium bowl, add the sliced beef, minced garlic, fish sauce, oyster sauce, vegetable oil and ground black pepper. Mix together working the marinade evenly into the meat. Allow to marinate while continuing with the next steps. In a small bowl combine water, oyster sauce, soy sauce, sugar and cornstarch. Stir everything together and set sauce aside for now. Cut the red onion into thin slices. Cut green onions into 1-inch long strips. If using fresh potatoes, remove the skin and then cut into strips about 3-inches long and 1/2-inch thick. Boil the potatoes for 5-6 minutes on the stove. Alternatively, place the potatoes in a bowl and cover with water. Cover the bowl with plastic wrap and microwave on High for 5 minutes. Drain the potatoes in a colander. If using frozen potatoes, thaw at room temperature or in the microwave. Heat a large wok over High heat and when hot add 1 Tbsp vegetable oil. Add the potatoes and pan-fry for 7-8 minutes or until they are golden brown. Transfer to a clean plate. Heat the same wok over Medium High heat and when hot add 1 tsp vegetable oil and the minced garlic. Stir-fry for 15 seconds. Add the red onions and stir-fry for 1 minute. Add the beef and stir-fry until it’s slightly pink, approximately 2 minutes. Add the potatoes and sauce. Toss together combining everything well. Cook for another 2-3 minutes or until beef is cooked to your preference. Turn off the heat, freshly ground black pepper and green onions. Thanks Trang for sharing! I love it the way you cooked the potatoes without deep fry it and it happens to be my favorite dish. I sliced the potatoes to the thin slice and didn’t have to cook it.